Poly chiffon dress in peach with a rose gold sequin bodice. Sweetheart neckline with ruching at the top of the skirt along. 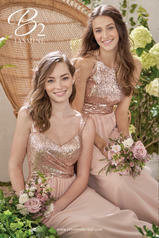 Thick, sequin straps that connect and extend to the back, hanging seperately from the dress in scoop. The perfect color and fabric combination for a captivating look.